I’ve been asked by several people to share my thoughts on the finished film, and while I will offer some initial comments I need to see the film again before I can be sure about things like composition, shot lengths, music and sound mixing, and story structure. Mostly I would like to discuss how the film has been received thus far. Beware of major SPOILERS! The internet affords a great number of ways in which we can discuss movies. David Bordwell has provided an intriguing guide to web criticism in a recent blog post that aims to detail the types of criticism that fills the blogs and websites of cinephiles like myself. It’s essential reading, since Bordwell stresses the importance of informed criticism and the long-form review. We’ve become too accustomed to capsule reviews and statements that often contain more exclamation points than periods. How many times have we read the line “George Lucas raped my childhood!”? One of the key issues surrounding the production of a fourth Indiana Jones adventure was the expectation factor. Many fans felt burned by the treatment of the Star Wars mythology in the prequel trilogy, which led to the ridiculous statement about Lucas ruining the childhoods of millions of fans. In many ways, the expectations for the Star Wars prequels were far higher than for Dr. Jones, yet we had to wait a few years longer for another Indy adventure than we did for another visit to Tatooine (16 years to 19 years). Fans had presumably learned their lesson from the Star Wars prequels not to expect the world from the creative artists at Lucasfilm. With the announcement that filming had begun on Indy 4, fans took a collective deep breath and crossed their fingers. Even though the prospect of another Indy film resulted in a more muted response from fans and critics, I still felt that the “fear the worst, hope for the best” attitude was a smoke-screen for a very high level of expectation. In recent weeks, the “lowered expectations” attitude has spread from fan forums to critical discourse. At Cannes, some suggested that as long as the film didn’t succumb to the fate of The Da Vinci Code — which was panned with enthusiasm at the festival two summers ago — then everything would turn out fine. In other words, as long as the film did not fail too miserably, then its wreckage might still be salvaged. Others thought that as long as Spielberg and company recaptured the magic from the first three films, limited the use of computer generated imagery, avoided too many references to Ford’s age, and kept the plot in the established canon of the Indy universe, then all would be fine. Low expectations, right? Hardly. Beneath the surface of the skeptical viewer is the one who wants it all, even though they’ll be the first to admit that to capture lighting in a bottle again isn’t really possible. What is more troubling, however, is how the first two Indy sequels have been spared from much criticism lately. Those films are “canon” and have come to be iconic representations of the character and the mythology of the series. Never mind the fact that at the time of each release, the films were held to be poor companion pieces to Raiders of the Lost Ark. The screenplay, written by Willard Huyck and Gloria Katz (”American Graffiti”), from a story by George Lucas, is serviceable but no match for the witty one by Lawrence Kasdan for ”Raiders.” Unlike ”Raiders,” the new movie’s script never quite transcends the schlocky B-movie manners that inspired it. Though it looks as if it had cost a fortune, ”Indiana Jones” doesn’t go anywhere, possibly because it’s composed entirely of a succession of climaxes. It could end at any point with nothing essential being lost. Jeffrey Boam’s screenplay for ”Indiana Jones and the Last Crusade,” which opens today at Loew’s Astor Plaza and other theaters, cannot match the wit of Lawrence Kasdan’s script for ”Raiders.” Yet of the three Jones films, ”The Last Crusade” may well become the sentimental favorite, the Indiana to end them all. Each film has its strengths and weaknesses, its triumphs and its flaws. The passage of time has seemingly erased the negative press that either sequel received upon their initial release. The darker and bloodier Temple of Doom has often been cited as falling outside the Indy canon because of its violence; the pulpy silliness of Last Crusade met its own set of detractors for treating the Nazis as broad comic figures. Kinesthetically, the film gets to you, but there’s no exhilaration, and no surge of feeling at the end. It seems to be edited for the maximum number of showings per day. Yet the blunt Freudian images of George Lucas’s story (the film is a male birth fantasy in which the hero must deliver a tribe of children from slavery in a dark, damp mine shaft) and the relentlessly juvenile focus of Spielberg’s mise-en-scene come to seem oppressive and pandering; the film betrays no human impulse higher than that of a ten-year-old boy trying to gross out his baby sister by dangling a dead worm in her face. Given the subsequent installments, it is hard for me to muster enthusiasm for a franchise that has done so much to dumb down movie scripts, ramp up movie tempos, perpetuate colonialist stereotypes, and, yes, marginalize women. Most egregiously, the films in the Indiana Jones cycle have grown increasingly shallow and preposterous. Some might say that’s part of their charm. Rickey’s critique of the series is informed by little research and lacks a credible source for any of her points. In some sense, the critique is no different than any garden variety cultural study of the films, where words like “imperialism,” “colonialist,” and “masculinist” are tossed around with very little care. This is not to suggest the criticisms are off base. Rather, this sort of argument requires a more rigorous framework that is too imposing for the confines of pop journalism. We should value contrarian views, but not at the expense of rigorous research and development. As some of you know, I’m very skeptical of such grand theorizing, especially when it seems to promote the author’s agenda more than it informs our understanding of a particular film. If we want to really understand how Crystal Skull fits into the canon of Indiana Jones, then we need to step outside our expectations and consider the stylistic and narrative components of the film. On that basis can we begin to piece together what went right and what went wrong. I’m not trying to suggest that these films are immune to critical inquiry. Effective criticism should not offer an indictment of what a film should be, but rather what it is. How does it work within the confines of its genre? How well or poorly does the film communicate the story? The style of action movies have noticeably changed since the late 1980s, and more significantly, Spielberg’s aesthetic and thematic style has changed as well. He has arguably become more confident with his storytelling techniques, resulting in challenging and cinematically arresting works, including A.I. : Artificial Intelligence (2001), Minority Report (2002), and Munich (2005). In the press, Spielberg tried to appease fans by suggesting that he would don the hat of his younger self for the production of Crystal Skull. Indeed, there was a concerted attempt in early press to stress the fidelity of the new film to the previous ones. Before entering the theater to see Kingdom of the Crystal Skull, my wife, Monica, told me something that really made sense to me: we’re lucky to have another Indy adventure. She’s right. No one needed to make another Indy film; in fact, the sunset finale to Last Crusade was a pitch-perfect sendoff to the series. To expect anything from the film other than a good time is asking a lot. Can we ask that the filmmakers bring their A-game to the show? Sure, and I completely believe that everyone’s heart was in it. Rather than a final chapter, I felt this to be another adventure for Indiana Jones; an addendum rather than a bookend. However, I could not help but feel that everyone was trying to emulate the tone and texture of the earlier films. It’s rather obvious that Spielberg dusts off an earlier style in action scenes, but the result is noticeably stiff. There is a distinct self-consciousness to the work that limits the effectiveness to some of the action set-pieces. The film is different from its predecessors, since it is made nearly two decades after the last installment. Why should we disparage Spielberg and crew for evolving their style? To be honest, that is my big criticism of the film. There’s a stunted feeling to the narrative that may be the result of the stitching together of various screenplay drafts. My own feeling is that the script needed another one or two drafts to polish some of the exposition and deepen the relationship of Marion and Indy and Mutt. We undoubtedly expect too much, especially from filmmakers who have helped to shape the look and sound of modern American movies. Does it stand with the other sequels? Absolutely. It’s not as sharp or terrifying or silly as the others, but it has its own flavor. The science-fiction angle of the plot made perfect sense to me. Not only did the film capture the surface anxieties of the 1950s — McCarthyism, nuclear annihilation, the suburbs — but it also captured the pulpy fascination with saucer men from Mars. Some will say, “Yes, but is it Indiana Jones?” Of course it is. Every film had its dose of supernatural superstition. The archaeological component is not a large component to the latest adventure, but the subtext about alien archaeologists put a big smile on my face. Specifically, I have always been enamored with Spielberg’s thematic interest in extra terrestrials. All I can say is that it feels like home to me. And — major spoiler coming — when the alien travelers are revealed in the film’s climax, I was immediately reminded of the look and shape of the creatures from Close Encounters of the Third Kind. They’re a constant in the bearded-one’s work, and work wonderfully well in the spirit of the 1950s saucer conspiracies. In general, the first forty minutes worked flawlessly to reintroduce Dr. Jones. The prairie dog opening was fun, but I feel that I’m on the outside of an inside joke between Spielberg and Lucas. The warehouse scene was concise enough not to linger and embellish the connection between it and Raiders. It also featured the best joke in the film: Indy miscalculating his jump and landing on the wrong truck. My own love for Spielberg’s suburban animism was beautifully reworked in the Doomtown sequence. Adding to the mythology of the Jones story, I thought it was particularly nice to know that when America entered World War II, Indy fought the Nazis and came away a decorated war hero. There is a laundry list of smaller items that I loved about the film, none more satisfying than Indy’s school-boy reaction to seeing Marion for the first time. As the credits rolled, I must admit that I felt the same way. I go for geography. I want the audience to know not only which side the good guys on and the bad guys on, but which side of the screen they’re in, and I want the audience to be able to edit as quickly as they want in a shot that I am loath to cut away from. And that’s been my style with all four of these Indiana Jones pictures. Quick-cutting is very effective in some movies, like the Bourne pictures, but you sacrifice geography when you go for quick-cutting. Which is fine, because audiences get a huge adrenaline rush from a cut every second and a half on The Bourne Ultimatum, and there’s just enough geography for the audience never to be lost, especially in the last Bourne film, which I thought was the best of the three. But, by the same token, Indy is a little more old-fashioned than the modern-day action adventure. Spielberg’s technical skill as a director has always been closely linked to the tenets of classical Hollywood style. His adherence to eye-line matches, graphic matches, and the 180 degree line – where the camera obeys an axis of action over an entire sequence – might not sound so revolutionary, but it is has been one of the keys to his success as an innovative storyteller. In this sense, Spielberg subordinates style for story clarity. Though he is not one to shy away from breathtaking shots and jaw-dropping visual effects, this “stylish style” (to use David Bordwell’s phrase) is presented in an open and transparent manner. In other words, it’s all there on the screen to be appreciated. In the above quotation, Spielberg is discussing two elements of visual style. His preference for clearly defined spatial geography is not unlike many other contemporary filmmakers, who build scenes out of stable blocks of shots: master (establishing shot), medium, and close up. You establish the space with a wide or long shot, then move in for greater details and drama once direction and “geography” has been defined. David Fincher comes to mind, so does Paul Thomas Anderson, the Coen brothers, and Michael Mann. However, more and more films – including the Bourne series – sacrifice visual clarity for kinetic rhythm and movement. Part of the speed is the story. If you build a fast engine, you don’t need fast cutting, because the story’s being told fluidly, and the pages are just turning very quickly. You first of all need a script that’s written in the express lane, and if it’s not, there’s nothing you can do in the editing room to make it move faster. You need room for character, you need room for relationships, for personal conflict, you need room for comedy, but that all has to happen on a moving sidewalk. This constitutes the second element of visual style under discussion. The speed at which Spielberg cuts appears to be on the slower side compared to other directors in the industry. The fact that he needs to outline his preference for editing precision and concision comes off like a defense against the industry “norm.” While I have not completed an average shot length study of Spielberg’s work, it is clear that other filmmakers are indeed cutting faster. Yet it remains to be seen if faster cutting has resulted in more stylistically innovative, comprehensible, or successful films. Compare, for example, the action scenes in Christopher Nolan’s Batman Begins to Michael Bay’s Bad Boys II. While Nolan stresses the congruity and geographical integrity between shots, Bay abandons this compositional value for the rapid-fire “feel” of an entire sequence. With respect to Spielberg’s own editing style, I would hardly call it conservative. He may be more methodical and deliberate than Martin Scorsese but it depends on the genre in which each director is working. The flamboyant Scorsese (The Departed) is faster to the draw than the serious Spielberg (Amistad). 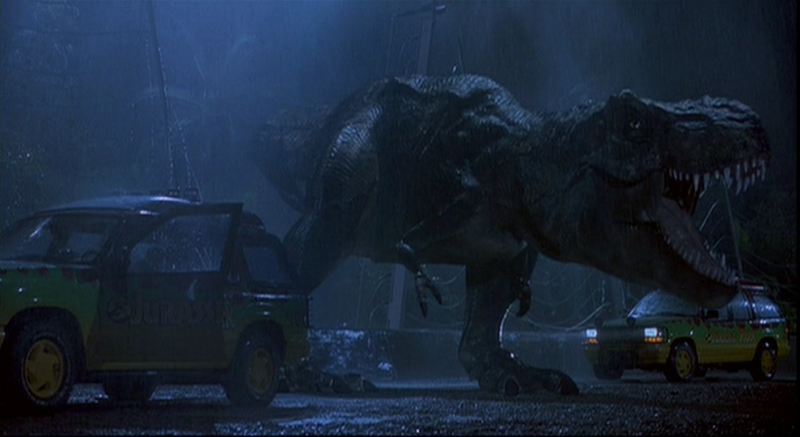 Even in an adventure film like Jurassic Park entire sequences play out with very traditional setups. The introduction of the T-Rex is first revealed offscreen on the sound track, then visually by the cup of rippling water. The first time we actually see the angry predator, it’s a wide shot – much like the introduction to the Brachiasaur earlier in the film. 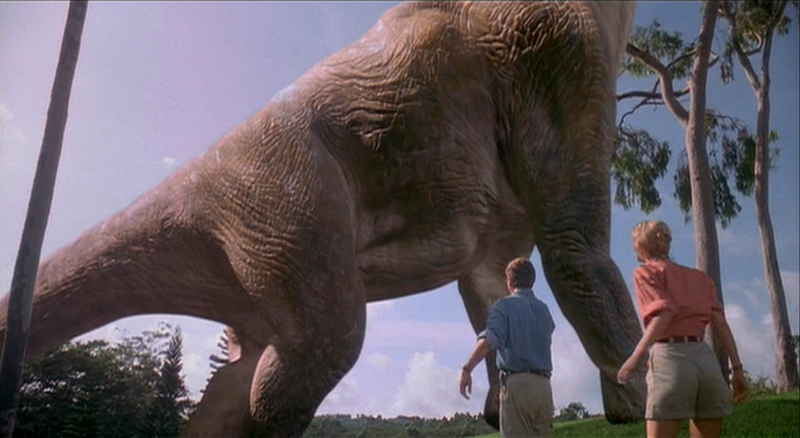 As the T-Rex sequence continues, Spielberg has established the space of the scene using eye-line matches and other directional strategies to orient the audience. In many ways, this enhances the suspense of the scene because we’re fully aware of the proximity of the T-Rex to the other characters. By citing the visual styles of Chaplin and Keaton Spielberg reinforces his preference for stylistic transparency. Although Charles Chaplin used far more close ups than Keaton, both silent comedians earned their keep by convincing audiences that their stunt work was the real deal, not the result of a camera trick or a stunt man. In Modern Times, Chaplin (who is blindfolded) rollerskates dangerously close to the edge of a second or third floor department store balcony. In Steamboat Bill, Jr. and College, Buster Keaton narrowly avoids being crushed by a falling housefront. Each of these iconic moments are captured in a single take and in long shot to “sell” the danger and “realism” of the stunts. The idea is, there’s no illusion; what you see is what you get. My movies have never been frenetically cut, the way a lot of action is done today. That’s not a put-down; some of that quick cutting, like in The Bourne Ultimatum is fantastic, just takes my breath away. But to get the comedy I want in the Indy films, you have to be old-fashioned. I’ve studied a lot of the old movies that made me laugh, and you’e got to stage things in full shots and let the audience be the editor. It’s like every shot is a circus act. Stressing the need for long shots and deliberate pacing for effective comic gags, Spielberg underestimates the innovative spirit of his own visual style in dramatic situations. His preference his “in-shot editing” is clearly evident in Munich. In one scene, Avner (Eric Bana) and his partners discuss the logistics of their next target assassination while inside a small car. Spielberg’s camera slowly pans from the hotel (site of the assassination) to the car’s side-view mirror, in which Steve (Daniel Craig) is reflected. As he speaks, the camera continues to move laterally towards the car’s rear-view mirror. Hans (Hanns Zischler) comes into view as he finishes Steve’s sentence about who they may be up against. The camera continues to focus on the rear-view mirror as Avner comes into view and says, “It’s definitely him.” A fourth visual plane is established when Hans holds up a photograph that blocks the rear-view mirror, which still remains the camera’s central focal point. The black-and-white image is of the man they are to kill, Al-Chir. As Hans describes the potential obstacles to the hit, the camera swings around to reveal Avner seated in the backseat, taking the photograph from Hans. The shot presents four planes of action that reveal key story information without a single cut. Instead, the camera moves around the confines of the car, using the various mirrors to reflect each of the characters who do not sit facing one another. The constricted space of the car does not limit Spielberg’s camera from capturing the visual details of the hotel (site of assassination), the worry on the group’s faces, and the assassination target. This type of shot is repeated in Munich as characters and objects are reflected in windows and mirrors to avoid superfluous cutting. While the story may provide the momentum, certainly we cannot dismiss the movement of Spielberg’s camera as contributing to this sensation of speed. I still wanted the film to have a lighting style not dissimilar to the work Doug Slocombe had achieved, which meant that both Janusz and I had to swallow our pride. Janusz had to approximate another cinematographer’s look, and I had to approximate this younger director’s look that I thought I had moved away from after almost two decades. This is an intriguing admission, since it points to Spielberg’s desire to return to a style of filmmaking that he no longer practices. Perhaps Spielberg and George Lucas feel that it is necessary to emphasize the timelessness of Indiana Jones by sticking to a very time-specific style. For many fans, it wouldn’t be an Indiana Jones film without the signature iconography of the series, which includes Indy’s hat and leather jacket, the ubiquitous map line, and the many creepy crawlies that Indy must swat, crush, and flick. Of course, this iconography also includes the characteristic action set-pieces, hair-raising stunts (sans CGI), and buoyant John Williams score. It would appear that Spielberg and company are aiming to recreate a stylistic moment that has, by all accounts, influenced a generation of filmmakers to “out do” the Spielberg/Lucas one-two punch of action/adventure filmmaking style. Indiana Jones gave way to John McClane (Die Hard), the Terminator, and Jason Bourne. Computer generated effects have become more prolific, yet arguably present filmmakers with fewer options. Cutting rates have increased and action scenes are noticeably more frantic and fragmented. However, I am wondering if Spielberg is perhaps too aware of this recent stylistic trend. With Raiders of the Lost Ark and its two sequels, cutting speed and visual flair seemed to grow organically from the films, which is why they defined a new approach to an old genre. In the early 1980s, it wouldn’t be uncommon to hear critics bemoan Spielberg for hyperactive and disjointed action scenes. Now, those same critics long for the intelligible and witty textures of the Indy series compared to the numbing banality of M. Night Shyamalan and a slew of unremarkable superhero pictures. Obviously, I have yet to see Kingdom of the Crystal Skull, so I cannot comment on the film’s stylistic approach. Since Spielberg has been so outspoken on the visual style of the series compared to more contemporary editing/compositional approaches, I am curious to see if he is too self-conscious, too constrained, too judgmental of his own instincts. Because – as we know – when Spielberg’s instincts are sharp, we are in for a wonderful time at the movies.